Seriously . . . It’s Your Birthday? As the second child born to my family I was resented by my older sister in two ways. One, it meant she was no longer an only child and even worse I was born the day after Christmas. Until I was three she called me, “The After-Christmas Booby Price.” It was difficult for the family to celebrate my birthday. Everyone was busy buying gifts, preparing Christmas Eve dinner, decorating the house. My blessed day went unnoticed . . . sad, but true. My dad ducked out the back door and the next thing I heard was the sound of our car wheels zooming down the street. An hour later he arrived home with a stuff reindeer wearing a party hat. They fumbled to sign a card then yelled, “Happy Birthday!” I was presented with my day after Christmas sale reindeer and a card that read, “Happy Holiday Birthday, may you day be speciel.” Seriously, I did not misspell anything, that’s exactly how the card was printed. 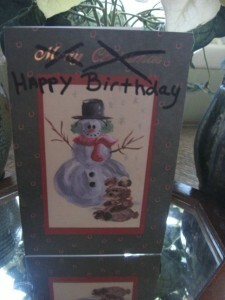 The box of Holiday Birthday cards they’d purchase was on the discount rack for a reason. Even at the tender age of seven I knew there was something terribly wrong with the grammatical structure of the sentence. My loving sister however did not forget my birthday. She gave me two beautifully wrapped gift boxes. She proudly said, “Happy Birthday little Sis. Here, open this one first!” I was so excited. I thought she hated me but I guess I was wrong. I sat on the floor beside the Christmas tree and opened the box. Inside was a sock. Not a pair . . . just a sock! Grinning from ear to ear she said, “Now open the other box!” I ripped it open only to find the match to the first one. “It’s your Christmas and Birthday gift!” Surprisingly, I was not amused. Mom was so embarrassed she insisted I take her birthday which happens to be in July. Maybe that’s where the expression Christmas in July originated? So to all of you who are unfortunate enough to share a birthday with a holiday let me be the first to wish you a very HAPPY HOLIDAY BIRTHDAY and may you day be speciel! 6 Responses to Seriously . . . It’s Your Birthday? HAHAHAHAHA! I would agree but I will NEVER forget labor pains! That’s right we share the same agony of a holiday birthday. I’ll remember to call and wish her birthday greetings!! lol! Try doing labor on Christmas – not an anesthesiologist to be found with drugs. That is my guilt to her forever. NO DRUGS!